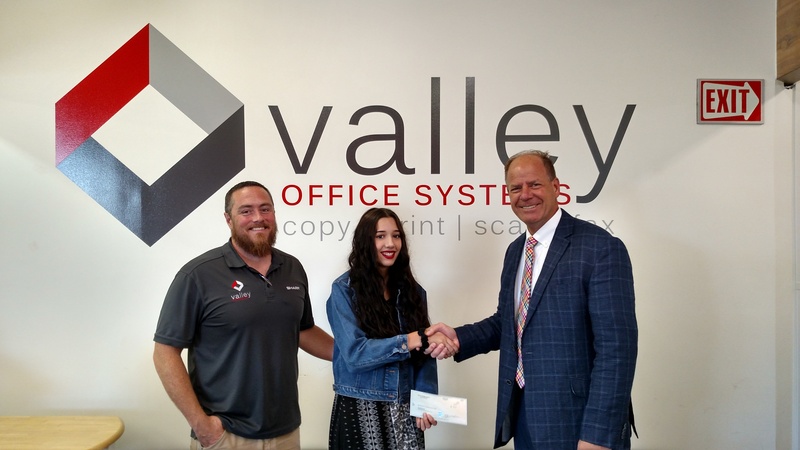 Mersadies receiving her scholarship check from Howard Hansen, President of Valley Office Systems. At Valley Office Systems, we're here to do more for you, your business, and our community. Since we've partnered with the Business Technology Association (BTA), we've been able to become the premier source of business technology and information. BTA connects businesses with the requisite educational programs, information, research, legal services, publications and guidance they need to function as efficiently as possible. BTA was founded in 1926 under the notion that there should be unity among typewriter dealers throughout the country. At the time, typewriters were how businesses communicated, and as various dealers, both independent and not, gathered in Kansas City, MO, the precursor to BTA, the National Association of Typewriter Dealers (NATD) was born. This association's goal was to increase the sharing of knowledge, ideas, success, and even failure so that others may learn as the whole of the association grew in numbers and expertise. Fast forwarding in time, As technology evolved and changed, it became necessary to rename the association once more, and with a landslide vote, Business Technology Association was chosen. Since that day, BTA has worked with innumerable companies to provide them with the information and resources they need to provide customers the business solutions they require. This has given Valley Office Systems the ability to truly address your office needs. Mersadies Morgan is a recent Bonneville High School Grad, finishing her tenure there with an impressive 4.3 GPA. Her work ethic in both her studies and work shows, as she is pursuing a higher education at BYU – Idaho where she aims to become a nurse practitioner, which will require a master's degree to achieve. Mersadies is following in her mom's footsteps as she works towards her educational and career goals. Her upstanding work in all aspects of life makes Mersadies a truly exemplary student and we wish her the best of luck in her future endeavors. With that in mind, it is with great honor that we present Mersadies Morgan with a $1,500 scholarship on behalf of both BTA and Valley Office Systems. Mersadies' father, Kevin Fullmer is a supervising Team Lead at Valley Office Systems. Mersadies was able to receive a scholarship from the BTA scholarship Foundation with help from Valley Office Systems thanks to working above 30 hours at her job, as well as being enrolled in 12 or more credits while in school. Valley Office systems is incredibly proud of both Kevin Fullmer, as well as his daughter, Mersadies Morgan for their outstanding work and effort in everything they do. We hope this scholarship continues to support those who go above and beyond in both the workplace, and the classroom for years to come. At Valley Office Systems, we not only help you win at business but we also help students win at education.